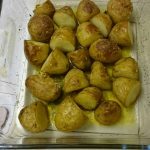 A meal everyone will eat with Cypriot New Potatoes. The holy grail of parenting/ meal planning - a meal you can serve up that everyone will eat. Doesn't happen often in this house. I've got two children who are dubious about mixed/ wet foods (bolognese bearable to one, not the other). Tigerboy is relatively straightforward but likes to eat one thing … [Read more...] about A meal everyone will eat with Cypriot New Potatoes.